Agakhan Place is about 2 kms away from Bund Garden in Yerwada on Pune-Nagar Road. 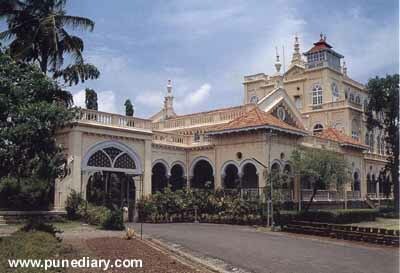 Agakhan palace is of Italian arches and spacious lawns. This building comprises of five halls. The palace covers an area of 19 acres, out of which 7 acres is the built up area and is an excellent building from architectural point of view. It captivates the eye of an spectator with its magnificence and picturesque beauty. Sultan Mohammad shah Agakhan built this Palace in 1892. It was built to help the famine affected people, when there was a famine in Maharashtra. It took 5 years and 12 lakhs to complete this Palace. Area of its ground floor is 1756 sq meters. That of the first floor is 1080 sq meters, whereas the second floor has a construction of 445 sq meters. Speciality of this structure is that ithas a corredore of 2.5 meters around the entire building. Prince Karim Agakhan donated this palace to Gandhi Smarak Samittee in 1972 and since then Parks and Gardens organization is maintaining this National Monumental Garden. This place does not look like it would have been used as a prison, but Mahatma Gandhi, Kasturba Gandhi, Shri Mahadeobhai Desai, Dr. Sarojini Naidu, Meera Ben, Dr. GLinder, Pyarelal Nayyar, Sushila Nayyar and others were kept under imprisonment over here during the Quit India movement in 1942. Mahatma Gandhi was kept here for 21 months. It was during this period that Shri Mahadeobhai Desai (15th August 1942) and Kasturba Gandhi (22nd February 1944) breathed their last in this place. Their Marble Memorials are beautifully designed by the famous architect Charles Correa which can be seen over here. Statue of the Mahatma Gandhi too stands here. Other than this the articles used by Mahatama Gandhi like his writing desk, his bed, Kasturba's Sari, clothes and her Footwear are preserved properly in their place of use. Pictures of Indian Independence Movement beautify the walls. Khadi Gramudyog Bhandar, Mahadev Chhapkhana, Rashtriya Mahila Sanstha, Stiching classes etc. is carried out here now a days. Readymade Garments, Embroidery, Fiber, Agarbatti, Candle and Chalk making classes are carried out here. Poor and the Needy are given a free training and the rest are changed a nominal fee for the training. This place is visited by a large number of tourists. It is open on all working days except national holidays.